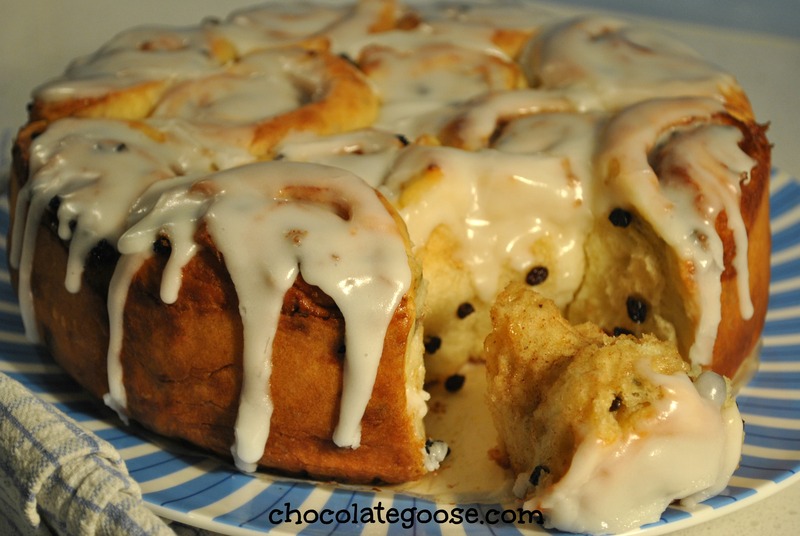 I have enjoyed Chelsea Buns ever since I can remember. They were sold at our school tuck shop and it was always a great day when I could finally buy one and enjoy the sticky sweet treat layer by layer. Now if I were to organise a Mother’s Day Morning Tea, which doesn’t have to happen on Mother’s Day, mind, because I’m sure that my friends would prefer to spend this day with their families, as would I. But it could happen any time and would really just be a good reason for friends to get together for a few hours to enjoy each other’s company, and pat ourselves on the backs for being such fabulous Mothers! Chelsea Buns would definitely be on the menu, but they do need to be served up pretty quickly after baking as they don’t stay fresh for very long. I mean within 24 hours is fine, but don’t try to store them for a few days. Just goes to show that when you home bake instead of buying the store made stuff, the lack of preservatives and other additives doesn’t make for a very long shelf life, but Fresh is definitely Best! This particular recipe is taken from an old New Idea magazine from years ago, but even without all the “How to” images, it is really easy to follow. Begin with the dough: whisk the milk, yeast and sugar together until dissolved. Cover and allow to stand for 10 minutes or until it is frothy. Place the flour into a bowl (no need to sieve it). Whisk the egg into the yeast mixture and add it to the flour. Stir with a butter knife until the mixture starts to come together. Knead it gently in the bowl until a soft dough forms. I find it to be quite a wet dough so take care not to over work it. Transfer it to a large greased glass bowl – have fun getting it off your fingers! Cover it with cling film and allow it to stand in a warm place for 30 minutes, or until roughly double in size. Next, make the cinnamon butter: Beat all the ingredients in a small bowl until fluffy. Grease a 24 cm round cake pan and line the base and sides with baking paper cut to size. Once the dough is ready, punch it to deflate it. Turn it out onto a lightly floured surface and knead for a few minutes (the recipe calls for 3, but I don’t like saying exactly how long), just until it is smooth and elastic. Roll out the dough into a 30 cm x 40 cm rectangle. Spread half the cinnamon butter over the dough and half the currants/sultanas. Fold in the two short sides of the rectangle to meet in the middle. Fold in half lengthwise so you have four layers of dough in a long thin rectangle. Roll it out again to a 20 cm x 48 cm rectangle and spread it with the remaining butter mixture and currants/sultanas. Roll it up firmly from one long side. Trim the ends if necessary and cut it into 12 equal portions. Place side-by-side into the prepared pan, cut-side up. Now is the time to switch your oven on to 200°C. Cover the baking tin with a tea towel and stand in a warm place for 20 minutes, or until slightly risen and any gaps between the rolls have closed. Brush with the melted butter (listed second on the list at the top). Cook in the pre-heated oven for about 40 minutes or until cooked through, covering lightly with foil halfway through cooking so the top doesn’t brown too much. Stand in the tin for 10 minutes before transferring to a wire rack (I use a spring form tin so it’s easy to release and remove from the tin without having to invert it). Lastly, combine the icing sugar with enough milk in a bowl until it is smooth and can be easily poured. Spoon it over the hot buns and allow them to cool completely.